Admittedly, it was a boring day. A Ground Hog’s type day where we were in a wash-rinse-repeat cycle and needed something to spice up our morning. 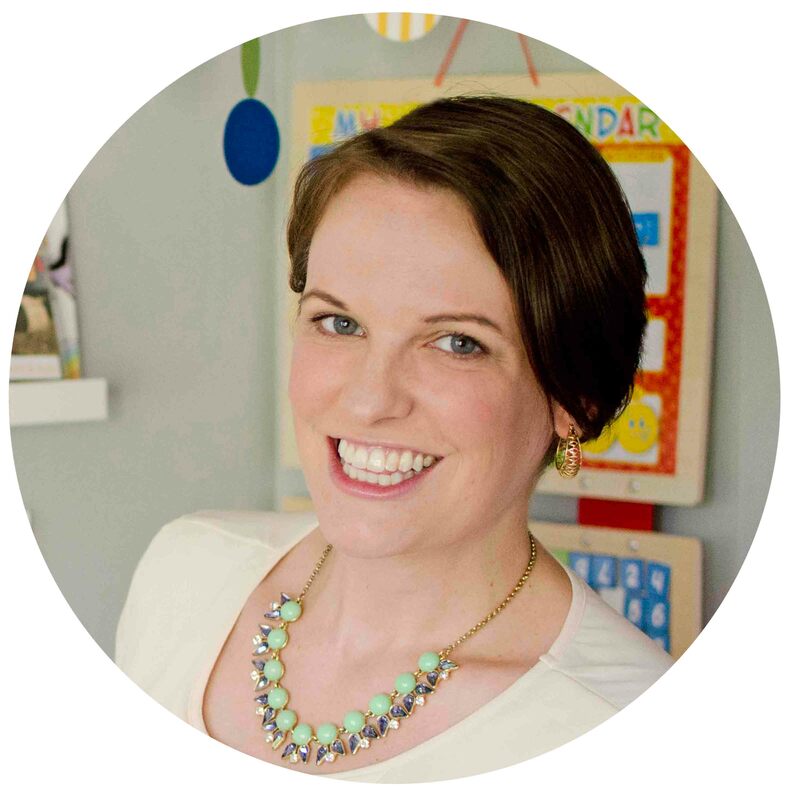 Oh, what’s a Mom to do to break out of the slump? The answer was so clear when I saw an empty tissue box. We needed a homemade dice (obviously – don’t worry, I’ll sell you on the fun). Whenever we have a boring day around here, I like to break up the monotony with something random that the toddlers won’t have ever considered (like when we did body painting or made a giant homemade shape puzzle). So when I was bored to tears, trying to resist the urge to turn on Paw Patrol, and considering the day a wash (I know you feel me), I spotted the empty tissue box and knew exactly what we needed. Plus, I had seen a large dice in an activity on Days with Grey recently so I had big dice on my brain. This Roll & Cross game is so awesome. I used to play this game with my kindergarten and first graders to practice quick addition (I’ll explain how to extend this to that age group in a minute). For my 3.5-year-old, I needed to bring the play level down a little so it would be just right for him. 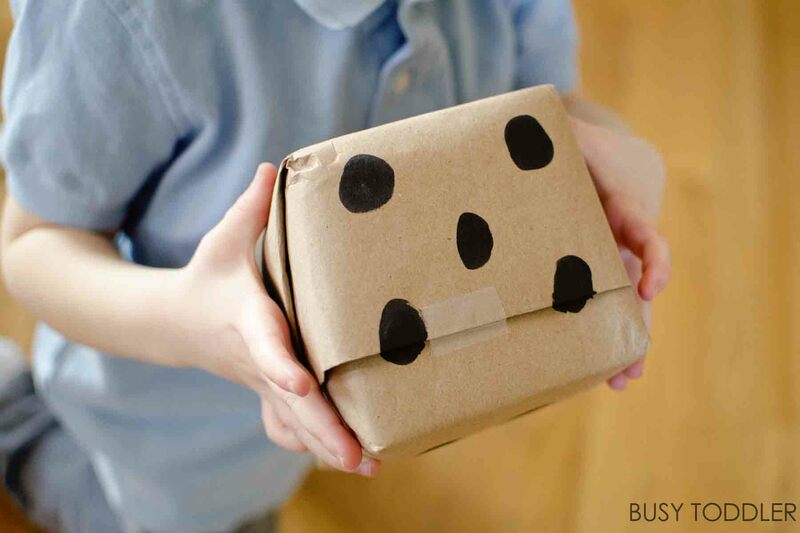 Step one is to wrap the tissue box in strong paper – I liked my choice to use Kraft paper but you can feel free to do what’s good for you. Once I wrapped the tissue box, I added pips (did you know that’s the actual name for dots on a dice?). Then I took a half sheet of construction paper and listed out the numerals 1-6. Have you figured out how this game goes yet? 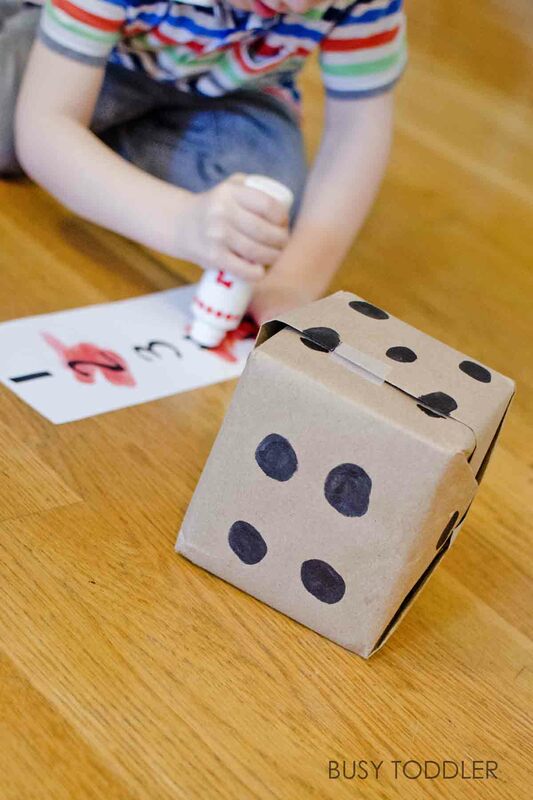 The goal of the game is simple: roll the dice and cross out the matching numeral. Kids.love.this. And I mean all kids. My 26-month-old went crazy for it. My 3.5-year-old loved it. My 34-year-old husband thought it was a hoot. 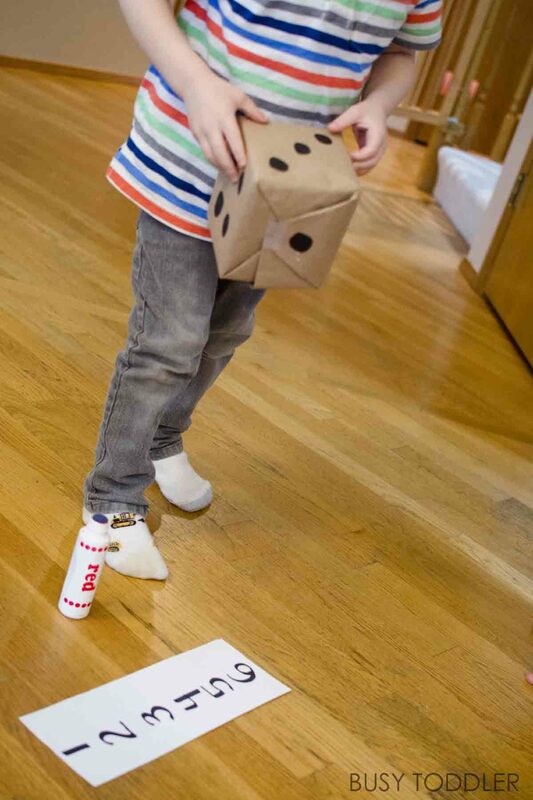 Tossing the giant dice is a great gross motor activity and gets kids moving by throwing it and chasing it down. Then, they count the pips and identify the numeral that matches. By the end of playing roughly 100 rounds of this, my 3.5-year-old had the dice pips memorized and could instantly recall which numeral matched. 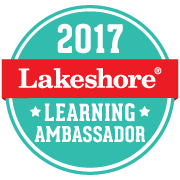 Check out all the ways to make this fit your kids! Instead of pips, write the numeral on the dice. Not into numbers? 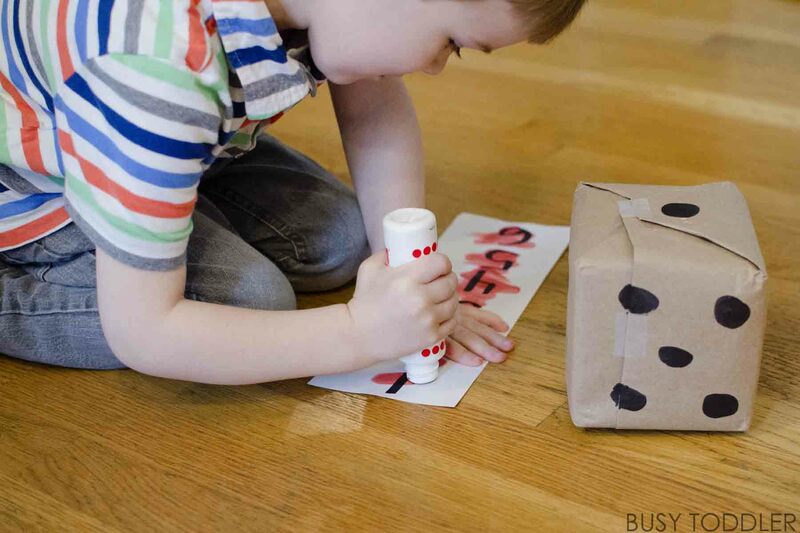 Write 6 letters on the dice and cross out the matching letter. Ready for addition? 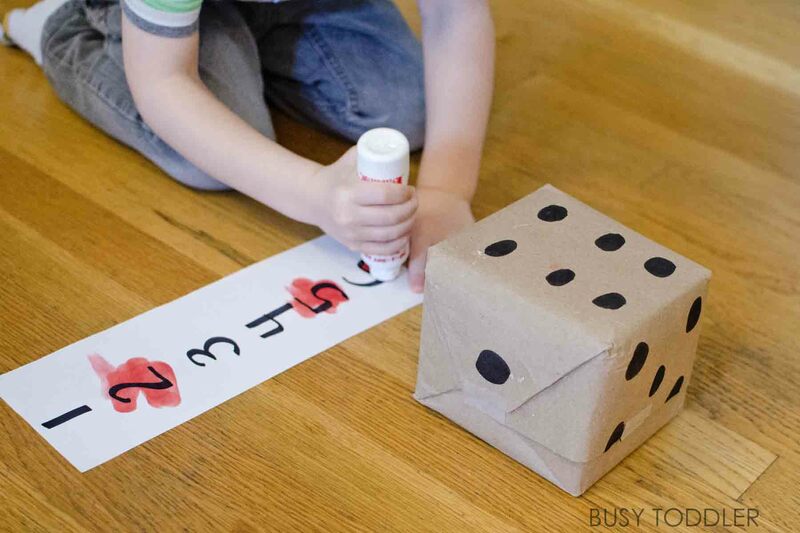 Toss TWO dice, add the numbers together, and cross it out. Just make sure to list the number 2-12 on the paper. Need a little competition? Race to see who can cross the numbers out first. That was the favorite when I did this with school aged kids. Sometimes, the days seem to be on repeat around here. 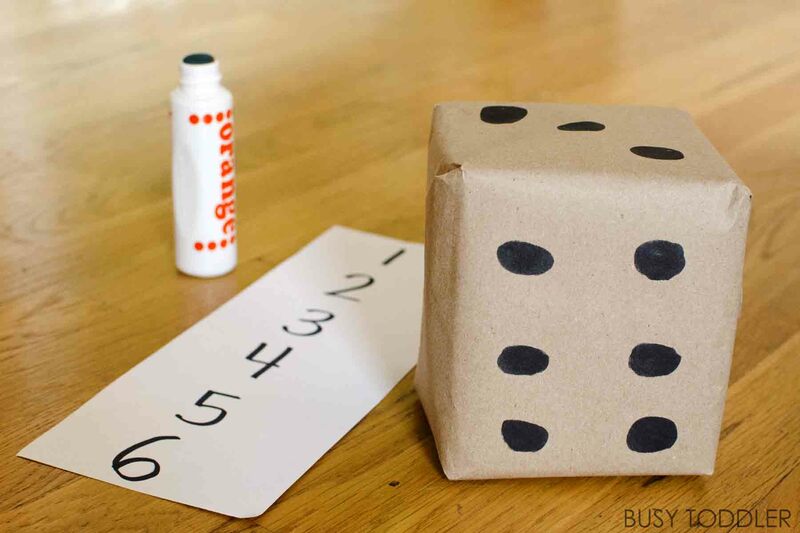 All you really need to get things back on track and active is a homemade dice and a fun math game. 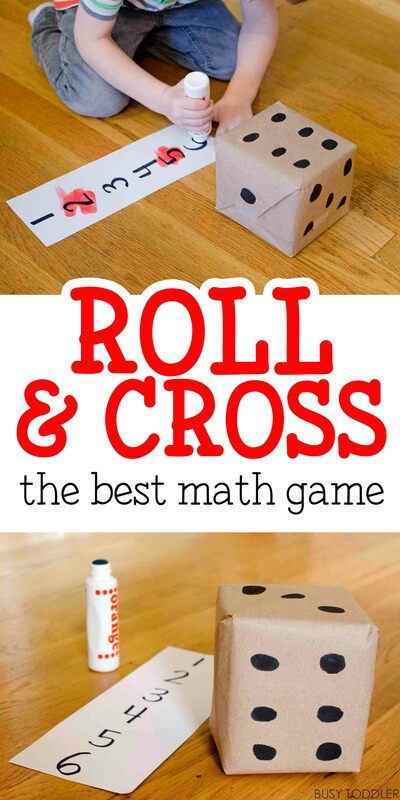 Roll & Cross is an easy math game to just have lying around the house (or classroom). It’s a quick game for kids and they love it. Somehow, it never gets old. 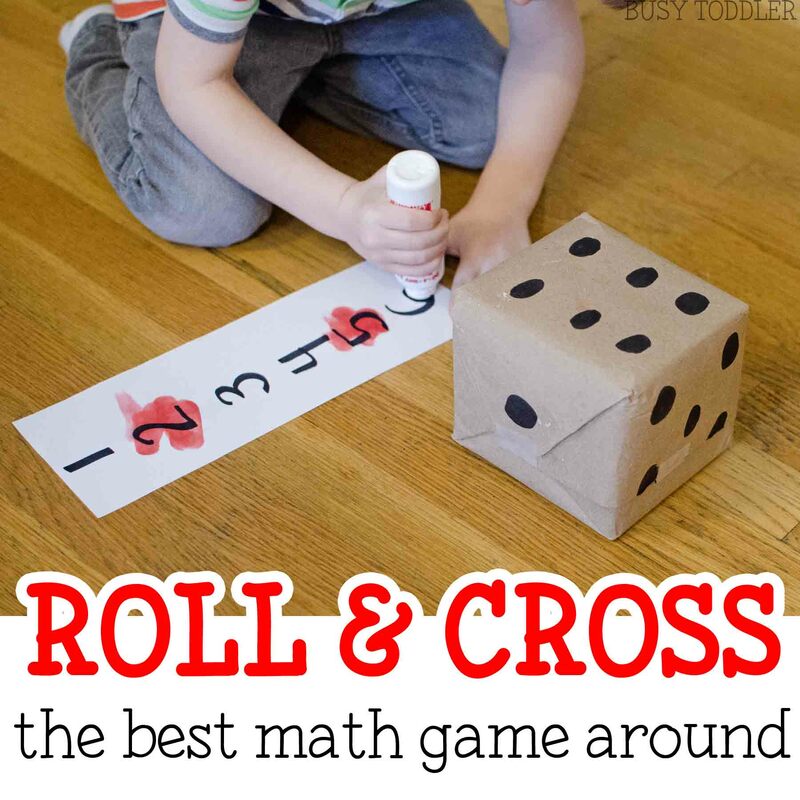 Will you try Roll & Cross with your kids? I have a 2.5 year old and I like the idea of switching this to letters to get her more keen on the alphabet. I know she will love throwing around the giant dice. Thank you for an idea that doesn’t cost a penny! 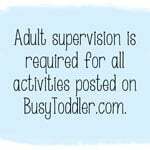 I love this making one for both children 2 and 4.